When I tired of certain shoes, I recall just getting out a can of paint from my Dad’s garage and painting them. One pair of yellow platforms I even covered with Dole Banana stickers. It all came full circle recently when a collector asked me to custom paint her leather boots. 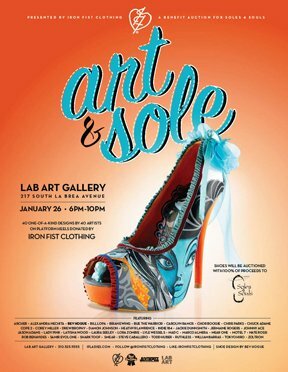 My experience designing shoes took a big leap forward when I was asked to contribute to the Soles4Souls event in L.A. Onto a simple set of platform heels I created my vision of how Beluxe art would translate as an art and fashion piece. Lab Art exhibited my creation, which was featured in Juxtapoz magazine. My custom heels and the work of other L.A. artists were auctioned off for the international charity. 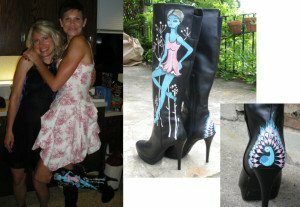 The next commercial step in Beluxe shoes was a successful licensing deal with L.A.’s Iron Fist , which distributed my Candy Fawn shoes worldwide as part of a larger line of Bev Hogue tees, jackets and tops.